encrypt them their php code and protect him. encrypt php obfuscator php code. You want to protect their php scripts for unauthorized change and the copy of individual functions? With Phpobsu the php code is made almost unreadable by all variables, functions, classes and Interfacees are replaced by random gennerierte combinations of numbers and letters.
. Your your included files work after encryption still the same as before. If certain variables are not encrypted, so they write them separated by commas, in a file called "db.txt". This file must be in the same directory as Phpobsu.exe. Furthermore, all comments and unnecessary line breaks are removed from the source code and the code thus optimized automatically. PHP Obfuscator PHP-Code Verschl & uuml; sseln. Sch & uuml; tzen your php-scripte mit Phpobsu Code Obfuscator vor unerlaubter Ver & auml; nderung und Weiterverbreitung. Phpobsu Code Obfuscator macht Ihre scripte nahezu unlesbar. Phpobsu Code Obfuscator Ersetzt alle VARIABLEN im Startscript, Sowie alle gleichnamigen VARIABLEN im gesammten Project. Phpobsu Code Obfuscator Entfernt alle Kommentare aus IHREM Kodex. w & auml; hlen Sie das Startscript ...... den Rast macht Phpobsu Code Obfuscator f & uuml; r sie. Ganze Verzeichnisse mit PHP-Code verschleiern. Protect your php, scripts with Phpobsu code obfuscator against unauthorized modification and redistribution. 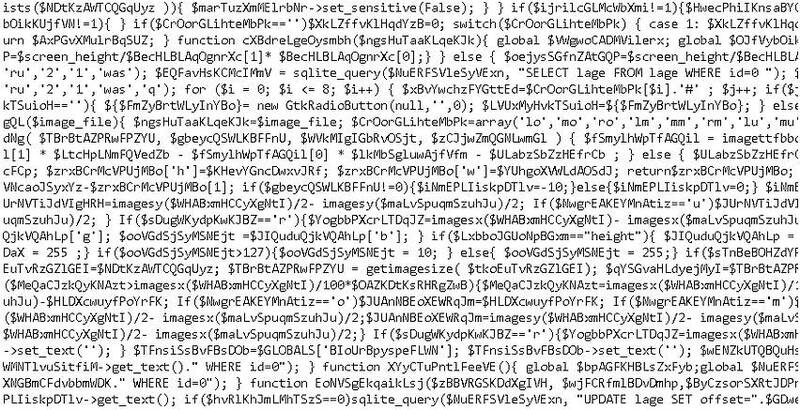 Phpobsu code obfuscator makes their scripte almost unreadable. Phpobsu code obfuscator replaces all variables, functions, classes and Interfacees of the startup script, as well as all of the same variables, functions, classes and Interfacees in the entire Project. Phpobsu code obfuscator removes all comments from their code. choose the startup script will do the rest ...... Phpobsu code obfuscator for them.